The duchess’s wedding dress was by Clare Waight Keller for Givenchy. The Duchess of Sussex turned to Givenchy to create the outfit for her all-important first joint engagement with the Queen. Meghan, whose elegant pure white wedding dress was designed by Clare Waight Keller for Givenchy, wore a neutral fitted belted pencil dress, featuring an unusual cape shoulder detail. 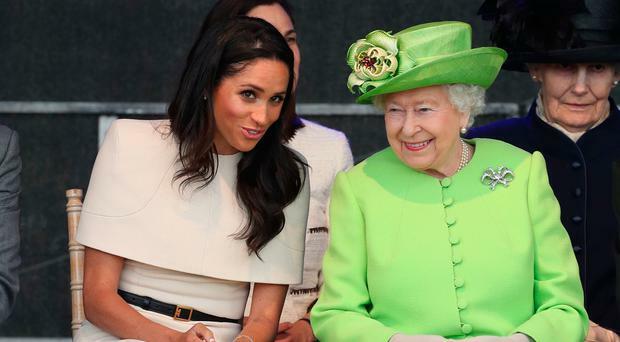 The Queen, who is known for her signature bright block colours and matching hats, wore a spring green coat by Stewart Parvin and matching hat by Rachel Trevor Morgan. Meghan, in contrast, did not wear a hat, and wore her hair down. The monarch and her new granddaughter-in-law, who wed the Duke of Sussex less than a month ago, arrived by royal train at Runcorn station to begin the day’s engagements before departing by car for the Mersey Gateway Bridge. While the Queen carried her trademark black Launer handbag on her arm, Meghan held a clutch bag in her hand. The monarch was wearing gloves, as she usually does when out and about shaking hands with the public on royal engagements. But the duchess was without gloves. Queen Elizabeth II and the Duchess of Sussex (second right) arrive to open the new Mersey Gateway Bridge, in Widnes, Cheshire.